No 52 in the Village signs series - Babingley - part of the Royal Estate. Babingley is one of Norfolk's lost villages. This small parish was located on the western side of the A149 -all that remains is the ruined church of St Felix . 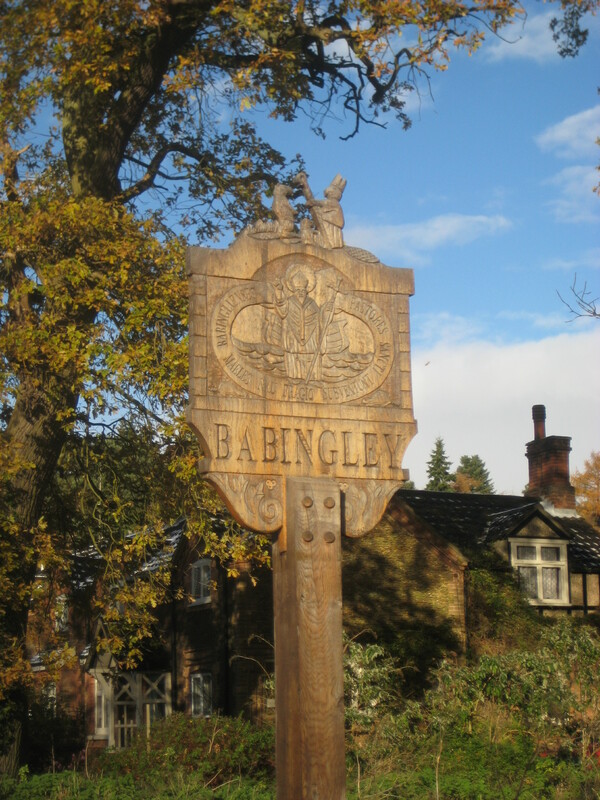 A Lovely carved wooden village sign for the Village of Babingley, in Norfolk. showing St Felix who came over from Burgundy in A 60. and brought Christianity to East Anglia. The first signs to be commissioned anywhere in Britain were erected in four estate villages at Sandringham by King Edward VII. The work was carried out by the Princess Alexandra School of Carving. More signs were ordered for other estate villages by George V. His son, Prince Albert, the Duke of York, made a speech at a banquet in 1920 in favour of them. His speech prompted The Daily Mail to organize a competition for the best design for a village sign. The winner out of 525 entries was St. Peter’s in Thanet. One from East Anglia was among the twenty-six runners-up, and that was Swaffham in Norfolk. The idea of a village having a fancy sign caught on and many more were erected over the ensuing decades. Many villages commissioned one in 1977 to commemorate the Queen’s Silver Jubilee. The first signs were made of wood, but more recent ones have used other materials, most commonly metal, but also others such as stone and fibreglass for example. Each one is unique and captures something of local significance, sometimes important buildings or landmarks (a great number in East Anglia depict a church), sometimes a famous person and sometimes an occupation such as farming. The cache is not on the village sign but very nearby! !